I saw Ballast Point's Barmy sitting on the shelf the other day and wondered what type of beer it is. 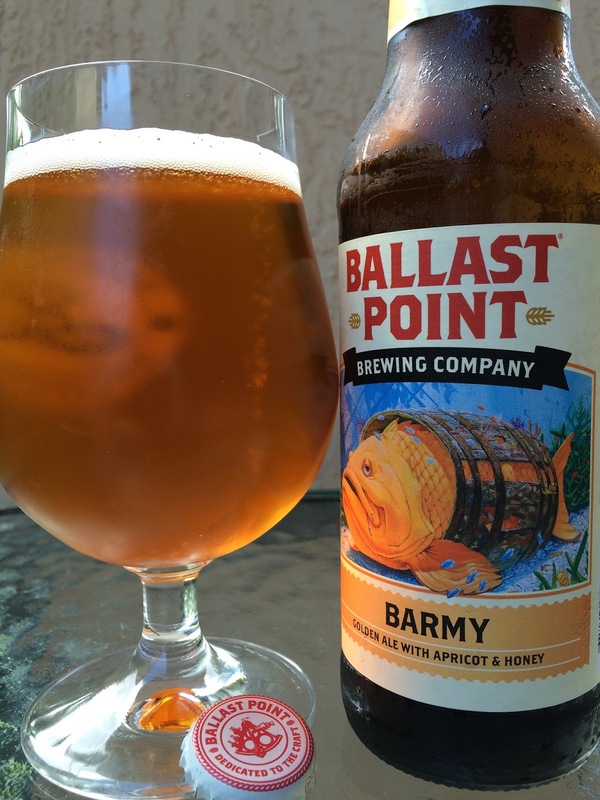 Barmy happens to be a huge 12.0% alcohol golden ale brewed with apricots and honey! So yeah, I grabbed a bottle. Not sure if there is such a thing as a Barmy Fish, but the one on the label that got himself stuck in an old beer barrel looks like he's had at least half of the sixer! Apricot and peach aroma, softly fruity with some honey sweetness as well. Sweet honey flavors also jump right out with the first sip. Thick, chewy. Boozy. Nicely spicy. Orange and apricot are nicely featured throughout. As the beer warms, those flavors come across more in a candied jammy way. On the almost too sweet side overall. Don't forget the alcohol because it didn't forget you. Fruitiness lingers on a wave of alcohol into the finish. I will say that a little warmth took most of that alcy edge off the beer. Not bad, but let it warm from fridge temps though not to room temperature is my suggestion.